I was diagnosed with osteoporosis in my early fifties after my physician gave me a DEXA test. She suggested that I see an endocrinologist in Ottawa, Canada (where I live) who is an expert in treating women with osteoporosis. The endocrinologist recommended a number of things for me including an osteoporosis exercise program. He recommended that I schedule an appointment with a local Physiotherapist who is a well recognized expert in exercise programs for osteoporosis. Thankfully, the Physiotherapist was in Ottawa. 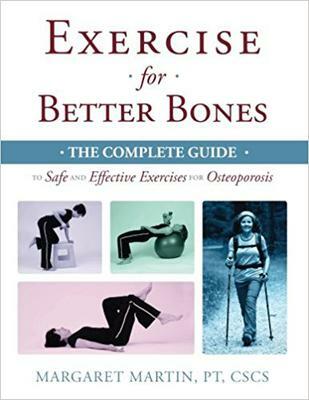 Her name is Margaret Martin and she is the author of Exercise for Better Bones as well as a course of Physical Therapists on osteoporosis, a book on Yoga and osteoporosis and an exercise DVD. I purchased the for Better Bones book from Amazon before I met Margaret. The book has four exercise levels (Beginner, Active, Athletic and Elite). I used the "algorithm" in the book (which looks at your fracture risk and activity level) to figure out that I should be following the Active level program. I started the program before I met Margaret. When we got together, she confirmed that I chose the right level, gave me additional directions and showed me other resources I could use on her website. Since then I have been following the program and seen significant benefits for my balance, strength and confidence. The book has exercises for strength, balance, flexibility, weight-bearing, and posture. It even outlines exercises you should avoid if you have osteoporosis. And there is a guide on activities of daily living. The website has a comprehensive list of all of the videos that demonstrate each exercise. The book has beautiful photos of the exercises and clear, understandable instructions. I highly recommend this book. I do not do yoga, but I bought my sister Margaret's Yoga for Better Bones book on Amazon. It provides a clear list of poses that should be modified or avoided if you have osteoporosis. My sister is very happy with the book. Finally, I decided to try the DVD, . It has three 35 minute workouts. I use it everyday!